Small, sophisticated restaurant attracts city slickers eager for upscale Mediterranean-style fare. 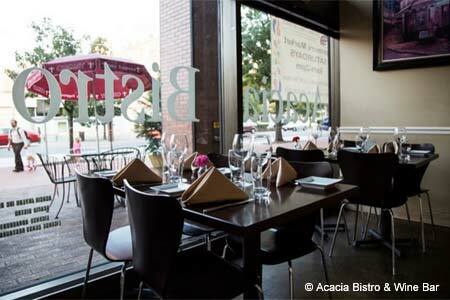 : Acacia Bistro's menu emphasizes small plates, heartier entrées, and cheese and charcuterie. Offerings may change seasonally as the kitchen is dedicated to farm-fresh ingredients, all the while reflecting the cuisines of Italy and the Middle East. The restaurant is well known for its smart wine list, so be sure to ask for the best selection for your lunch or dinner choices.